time: 8:35 a.m.; finish 4:15 p.m.
P3 – Devil’s Door Rapids – 30 m up the hill, 30 m down the hill in two minutes! Day 4 – From Eagle Nest Point To CS 723 East of The Fingerboards Is. Another clear sky day was on tap as we went through the usual routine after pushing back our sleeping bags and stuffing them into their compression sacks. Intent on not missing the rising sun, I snapped a shot of the islands of Green Island Bay to the northwest and another of White Rock some 400 meters offshore from Eagle Nest Point. We were on the water before 9 and headed north. After a day of coastal paddling, we had something else in mind for this day. 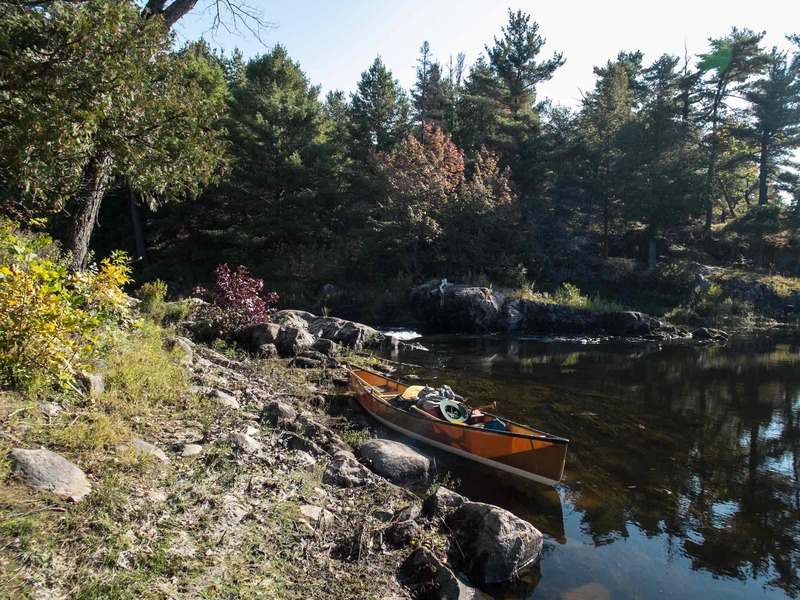 We were going to check out the French River’s two so-called Voyageur Channels, paddling up one and then coming down the other. Visions of Indigenous traders and guides and Canadien voyageurs and North West Company canoes came to mind as we made our way. No wonder that when the newly established Canadian Heritage Rivers program began in 1986 the French River the first river chosen! Paddling east on the Voyageur Channel we turned north into Black Bay. 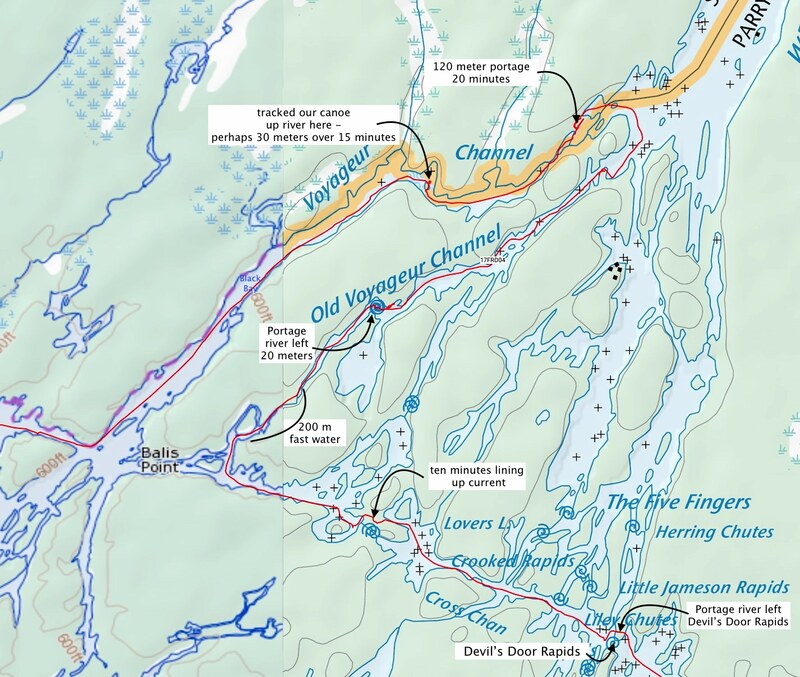 We planned to follow it up to the top and then take the channel which runs parallel to it on the east – the Old Voyageur Channel – back down to Balis Point before turning east on the Cross-Channel all the way to Devil’s Door Rapids. Even though we had the official Parks Map we had no idea of any complications along the way; the map does not show any rapids or portages. The map below shows what we found out over the next few hours! 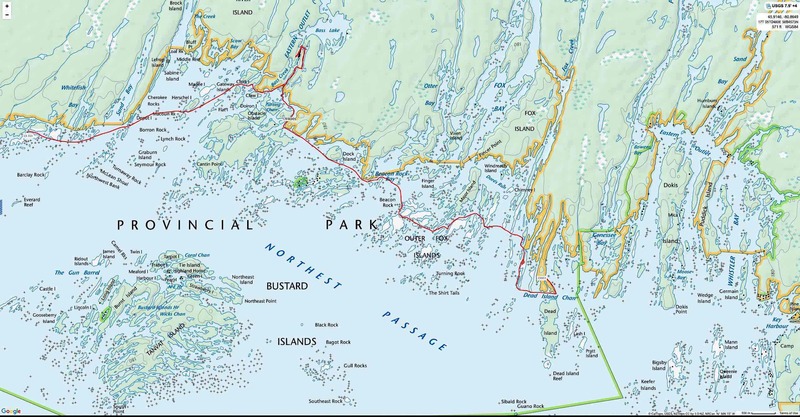 Black Bay is easy to imagine as a route the Montreal canoes (canots du Maître) would have come down; other than a short portage and a bit of lining there is little to impede easy progress. The canoes (10 meters in length and about 1.5 meters wide) were the freighters of the fur trade, carrying the trade goods from Montreal to the far end of Lake Superior and then returning with the furs. We stopped for lunch at the top of the Old Voyageur Channel and then started to make our way down. The channel is certainly more closed in than the Black Bay we had come up in the morning. We got to verbalize more expressions of what a sustained scenic trip this was! 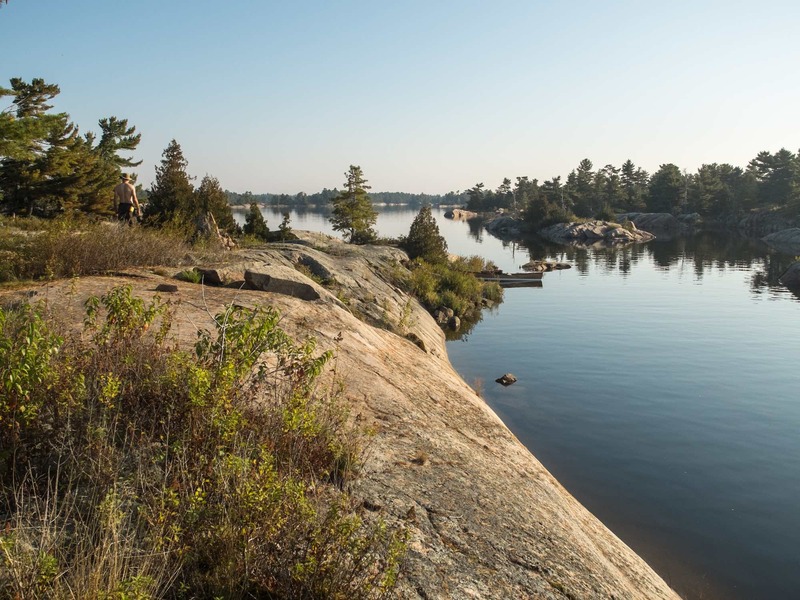 Having done canoe trips all over the boreal forest area of the Canadian Shield, we figure the French River area is not only one of the most accessible but also has the most day-after-day beautiful scenery. A bonus is that very little portaging is needed as you paddle around. 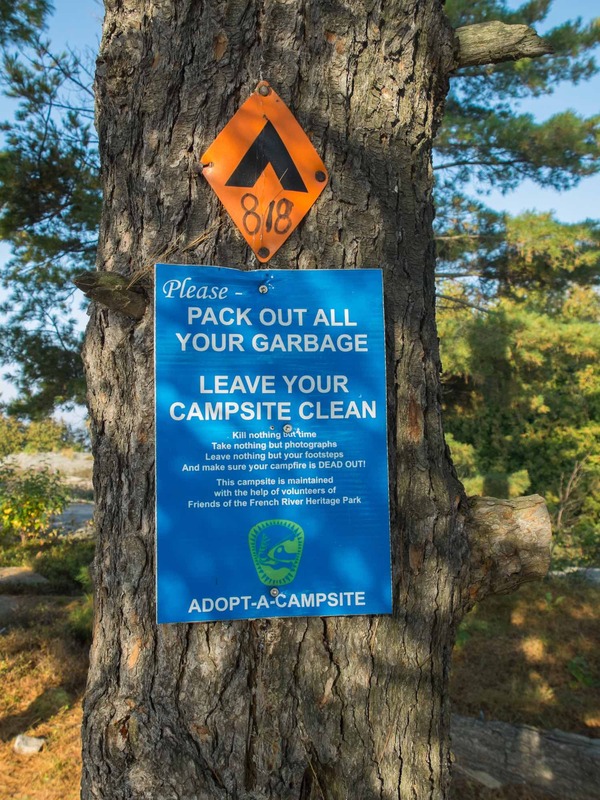 The campsites are mostly terrific. 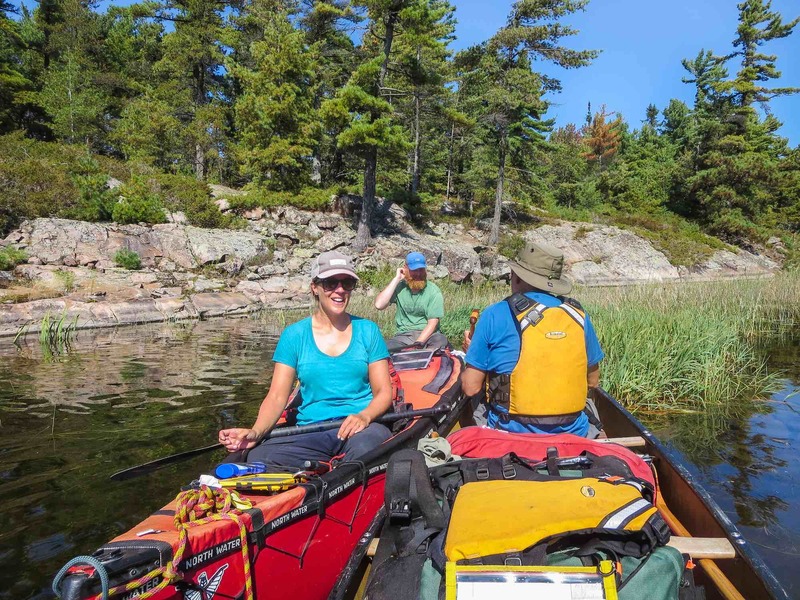 This is where you bring a newbie to introduce them to the pleasures of canoe tripping – but in June or September when it is less busy than it gets in the prime summer months. Hopkins. 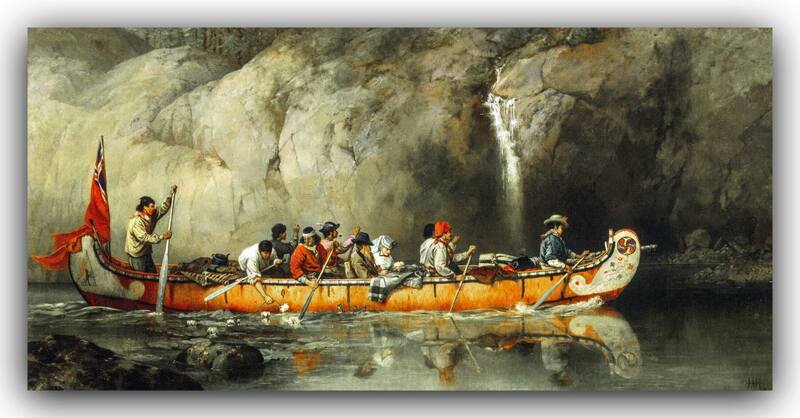 Canoes manned by voyageurs passing a waterfall. 1869. Just before we came to the one set of rapids on the Old Voyageur Channel we approached a canoe coming upriver. I was initially struck by the paddling technique of the couple in the canoe. They were alternating sides every four strokes. I remember thinking they were total novices out for a day paddle. Their response to my first question – “Where you guys coming from?” – was yet another reminder of the danger of rash judgments! Their response – “We started off in Alberta in May.” Whoa! We had paddled into Cas and Michael Wild, a newlywed couple from Scotland on the last leg of their epic canoe trip which had started at Rocky Mountain House in mid-May. Here it was in late September and they were on the home stretch to Montreal! We chatted for a while and then headed in opposite directions, they on to Lake Nipissing and the Mattawa River and on to the Ottawa. 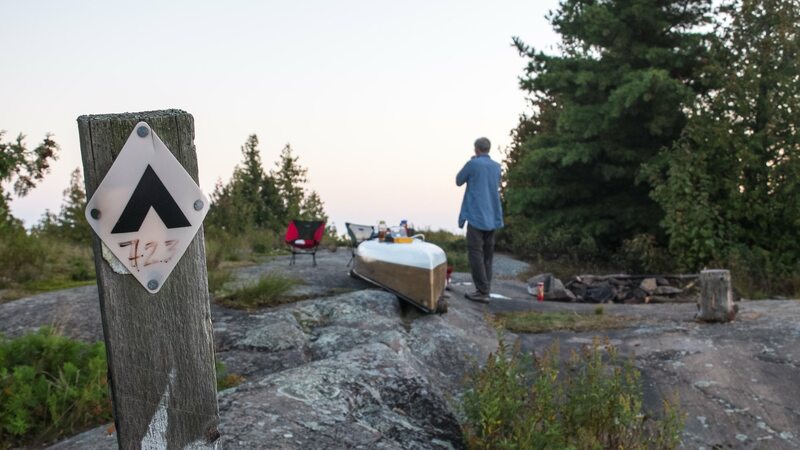 You can check out their website for more on their epic canoe trip at their WordPress website – The Doctors Wild. Up next – that set of rapids around the corner! 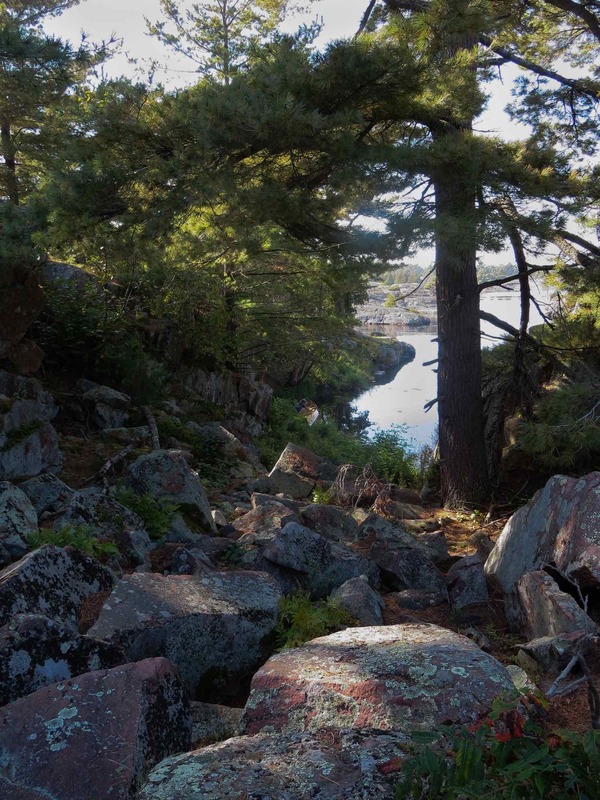 To the voyageurs it was known as Petite Faucille, an abrupt one-meter drop in the river. Given the length and depth of their canoes, a portage was the norm. 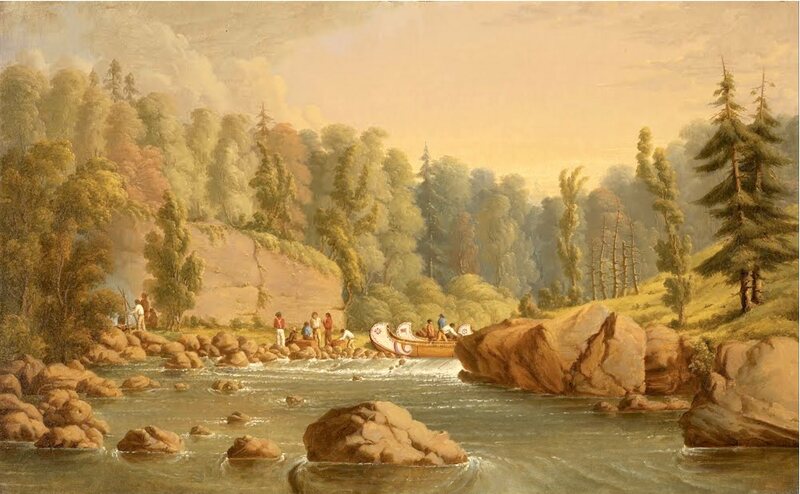 Until recently it was thought that Paul Kane’s painting “French River Rapids” depicted this very spot, turning the sketch he did at the scene in May of 1846 into a painting some years later after his return to Toronto. As I sat there on the rock I looked for the rock face on the other side of the river. It wasn’t there! The assumption over the years has been that Kane just took a bit of artistic license to heighten the drama of the scene at Petite Faucille. I have since learned that there is a better explanation, one that was not found until 2006 when Ken Lister set off with his canoe and Kane’s journal and a collection of Kane’s sketches. 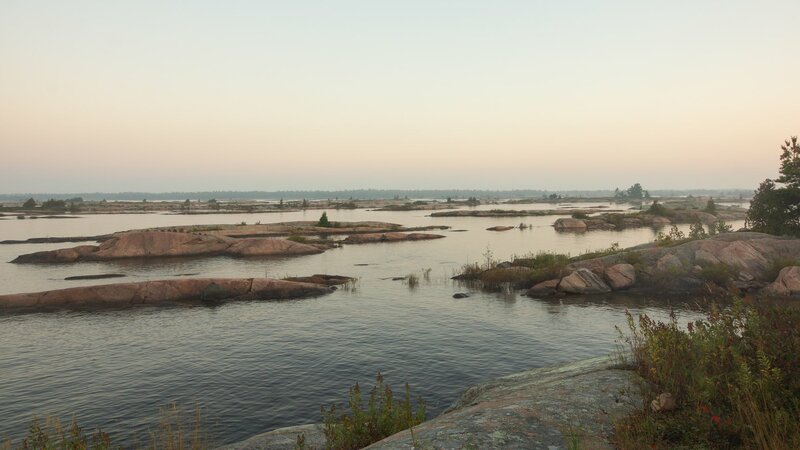 It turns out that Kane never came down the French River into Georgian Bay so he would not have had a sketch of any of the rapids! 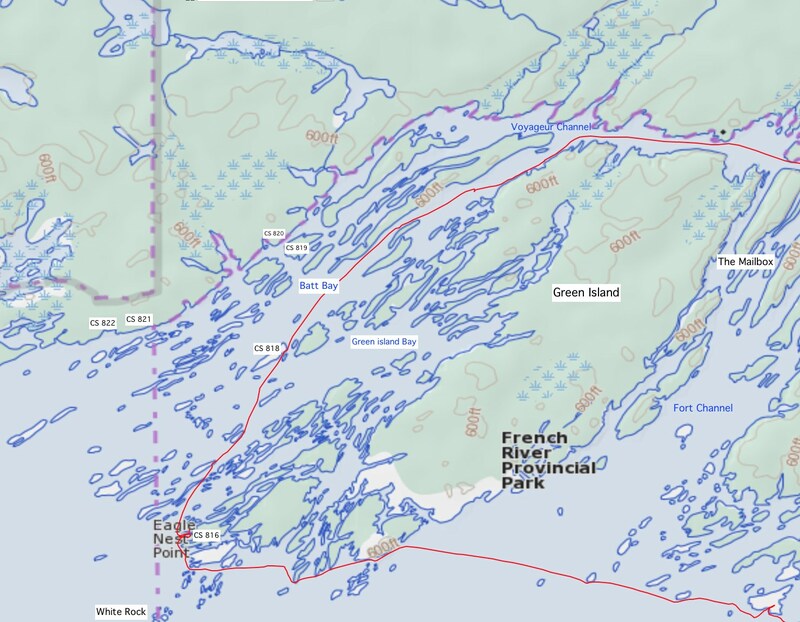 The French Portage—part of the Kaministiquia River–Dog Lake fur trade route between Lake Superior and Rainy Lake—was known to fur-traders as the Grand Portage des Français and was used to bypass a long section of the French River that was shallow and winding. See here for Lister’s account of his quest and how it all fell into place. We continued down the narrow channel; there are some swifts as you approach Balis Point that will speed things up a bit for about three hundred meters. The cross-channel from Balis Point to Devil’s Door Rapids is an easy paddle with only one set of rapids to deal with. We lined our canoe past them and continued on to Devil’s Door, certainly a dramatic name. We got there just as some kayakers were cautiously going over the ledge of the rapids – though “Falls” is a better word to describe the 1.5-meter plunge. They went over and then disappeared from sight for a moment and then reappeared as their kayak came very close to smashing into the left-side rock wall. We needed to take a closer look before we did anything! 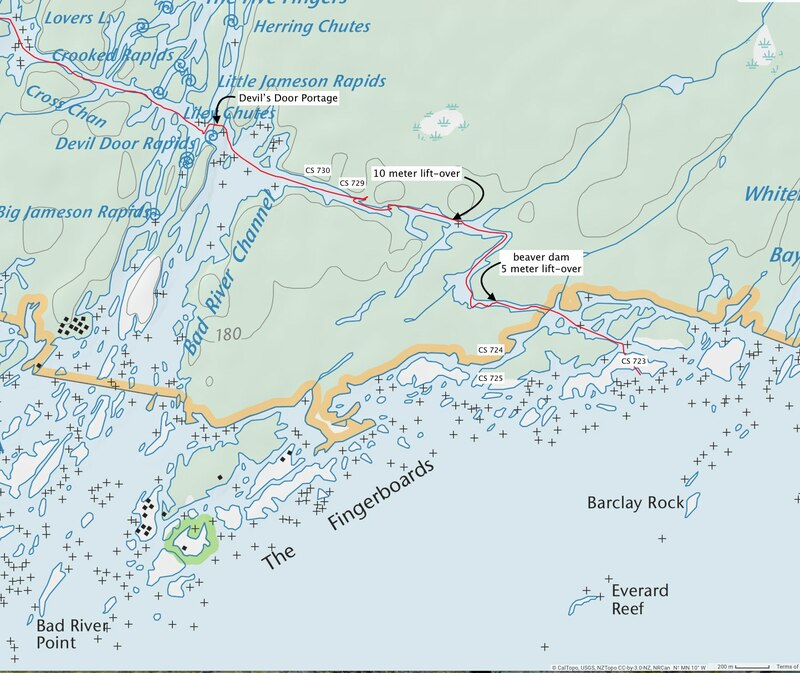 The Park map does not show a portage around the rapids. We headed to a small bay on river left, beached the canoe and scrambled up the rock to the top for fantastic views of the neighbourhood. A look down at the rapids, a look up the channel to where we had come from – and then decision time. We were going to portage. But where to portage? Our scramble up to the top of the cliff told us that this was not the way. Once back down to the canoe the answer became obvious. In our rush to get to that hilltop view of Devil’s Door we had not noticed the 30-meter “path” littered with boulders going up to a plateau. We walked up to the ridge and looked down another 30 meters to the shoreline and a tranquil bit of water below the rapids. This was going to be much easier than expected! We got the bags – the two Hooligan Packs and the two duffels – and the four paddles over first. Then I went back for the canoe. Max decided this portage would be captured in video and stood on the top of the path as I carried it up and over. Since the front of the canoe was at the rear, the first thing I had to do once the canoe was up on my shoulders was whirl the thing around. As for the carry – total time? Two minutes! No big deal! 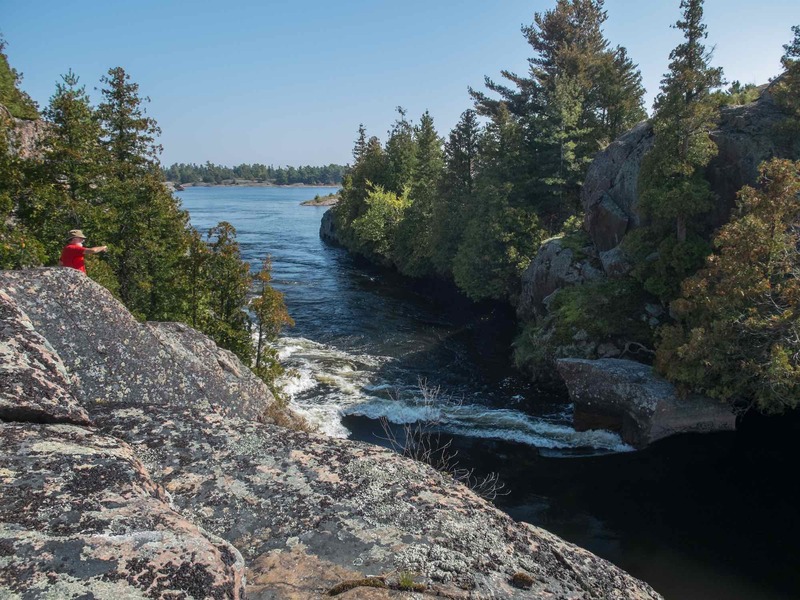 However, if you are looking for a bit more drama to go along with the name of the rapids, check out the account of the portage in this YouTube video – Devil’s Door Rapids – uploaded by a solo paddler earlier this year. 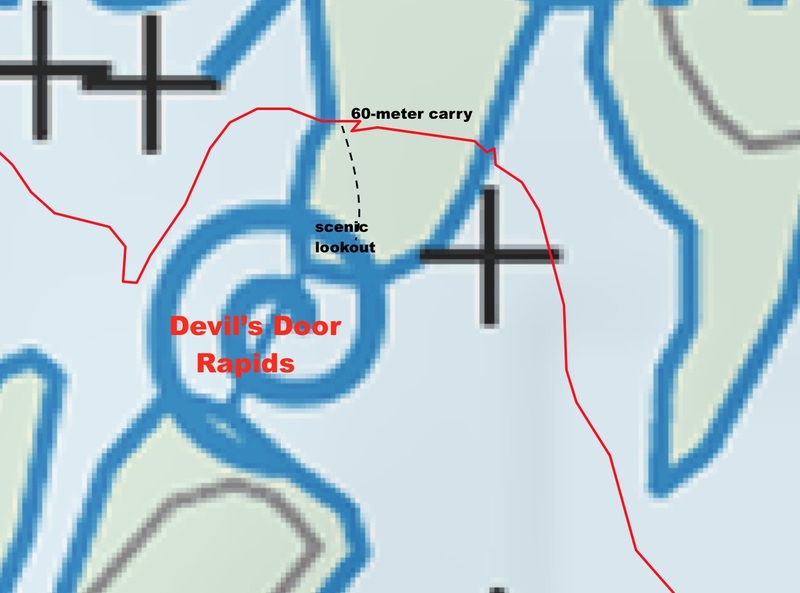 The Devil’s Door Rapids section begins at 10:00 and goes on for four minutes. It gives viewers a false impression and seriously over-hypes the 60-meter carry. It prompted me to upload to YouTube the one I included above. It is my very first – and maybe the only! – Youtube video, Devil’s Door Portage! Crossing Bad River Channel we headed for the continuation of the cross-channel and easier and totally enjoyable paddling down a narrow channel past lots of vertical rock face. Only two obstacles along the way, both dealt with in a few minutes. 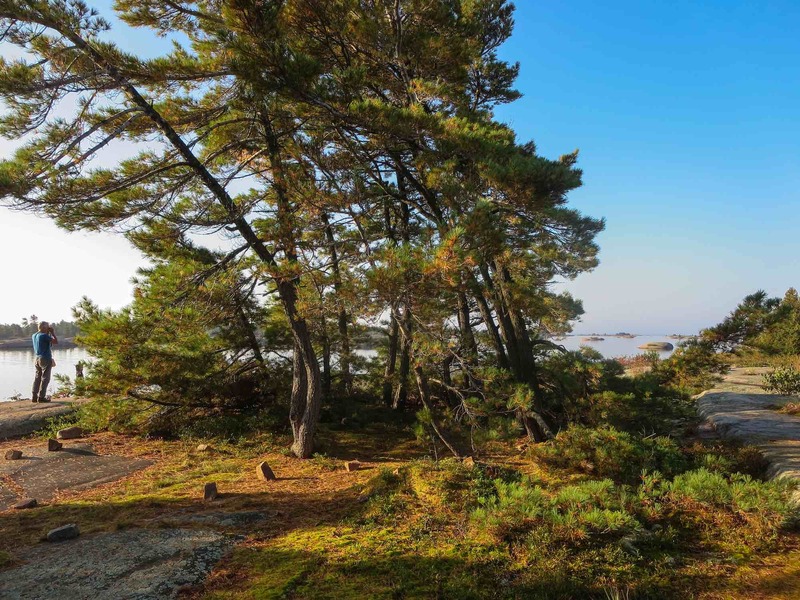 We were heading back to the coast and CS 723 on an island and accessed from the interior side. A 50-meter walk and you are on the Georgian Bay side. The collections of rocks on various flat surfaces are evidence of yet more tenting choices when tent pegs do not work. The tent spot we chose was a flat spot nicely tucked inside a stand of cedars and pines and with enough earth to be able to use those tent pegs. After we set up a line to hang our down sleeping bags on for a bit of wind and sun, we set up the canoe as a table top and got supper ready. That done we wandered over to the Bay side where, later that evening, we returned for some sunset views of the big water. We also got to see some old friends again – but from a different angle! 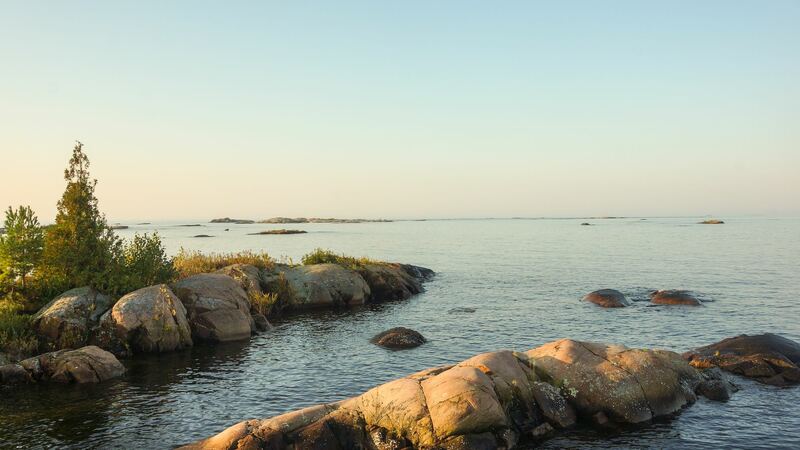 About four kilometers away from CS 723 are the Bustard Rocks lighthouses. We had approached them from the east on Day 3 and now we were looking at them from the north! 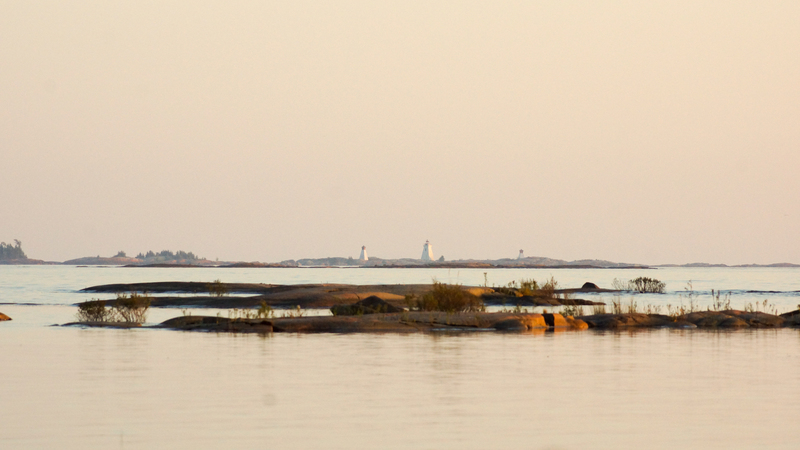 A few minutes later, with my back to the setting sun, I took a shot of the other side of the island campsite. A different look for sure! 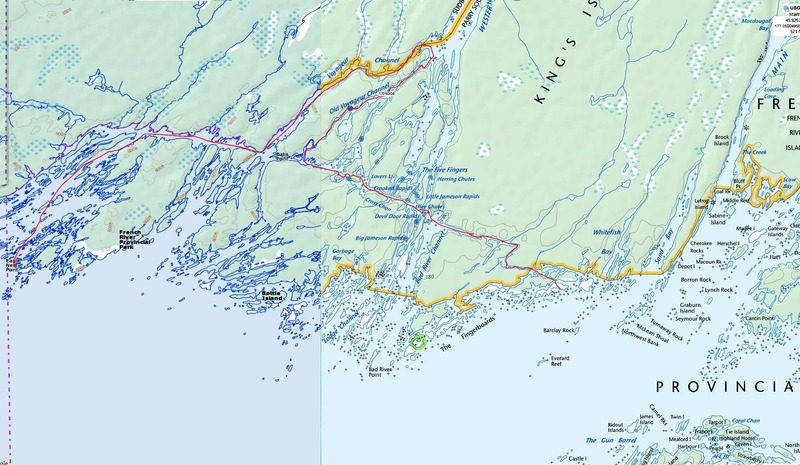 Day 4 had been a great paddling day; Day 5 would be a day we played tourist – paddling up Bass Creek to see what the portages were like – before heading back to the G’Bay coastline and a possible campsite in the Outer Fox Islands. There were none indicated on the official map but we were hoping to find something suitable.